Hello MHMS Parents just a friendly reminder Life Touch will be taking spring pictures on Monday starting @ 8:30 am at the MHMS Library if you have any questions or need an extra order form please stop by the office. Have a great weekend. Hello Parents there will be an 8th Grade Parent Informational Meeting on Monday February 25th on Early College High School. Meeting will be in the high school cafeteria at 6pm See you there!! Hello MHMS Parents: this is just a reminder that we will be having our Meet the Teacher today from 4:30 pm til 6:30 pm. See you there!! Hello Parents just a reminder DISD is registering returning and new to district students in the cafeteria today, Friday and Monday from 8:30am-5pm at the DHS cafeteria. See you there!!! Hello, Parents. Please encourage your child to attend tomorrow's workshops in Math (8th grade)/ Writing (7th grade) from 8am-12pm. Snacks will be provided. Hello Parents! 7th grade teachers would like to invite your student to our STAAR ready writing workshop tomorrow @ 8:00am. Breakfast/lunch will be provided. Please encourage them to attend thank you. Hello MHMS Parents: There will be a Dilley Early College High School informational meeting Tuesday, February 20 at 5:30 in the high school cafeteria. Thank you!! Due to scheduling conflict tonight's MHMS Student Council Valentines Dance has been canceled. Thank you! We apologize for the miscommunication. Tonights MHMS Pup awards have been postponed until further notice. Thank you. We are honoring our Grandparents today at Mary Harper Middle School. Please join us today September 11th from 9:00am thru 9:30am in the library for cookies and punch. See you here!! 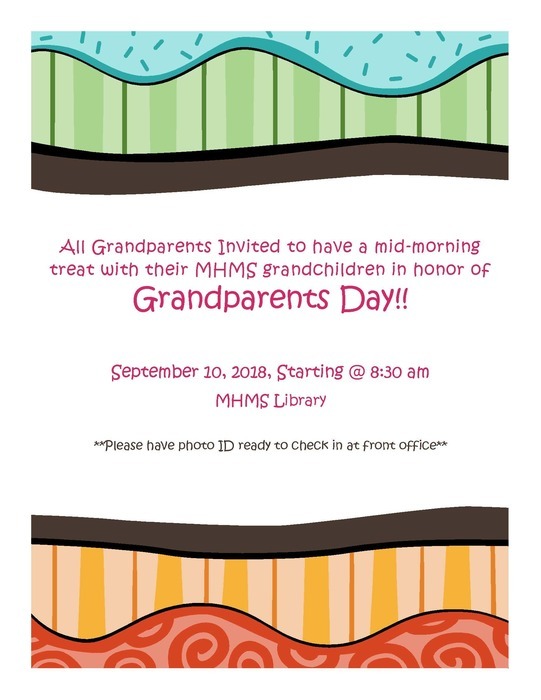 We will once again honor our Grandparents this year at Mary Harper Middle School. Please join us on Monday, September 11th from 9:00am thru 9:30am in the library for cookies and punch. See you there!! Hello MHMS Parents your are invited to attend our Meet the Teacher today from 5 to 7pm. If you have registered your student they will be able to view and pick up their schedule for Monday morning. Hello MHMS Parents if you have not stopped by to register your student please stop by today through Wednesday from 8am til 11:30am and 1pm til 4pm. If you have any questions please call MHMS office. Hello Parents Dilley ISD will be registering today and tomorrow at the high school from 8am til 5pm. If you have any questions please stop by the DHS cafeteria. Thank you and have a great day! Hello 8th grade parents: Reminder 8th grade recognition ceremony will be tomorrow at the cafeteria at 5:00pm. 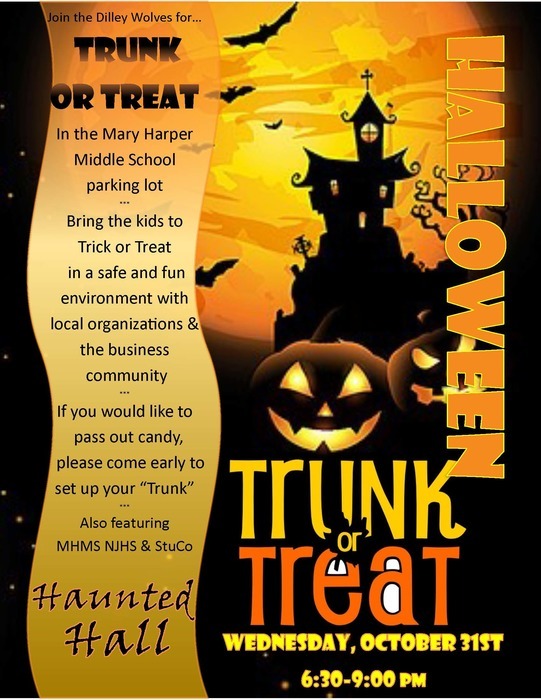 If you have any questions please call MHMS office. Thank you and have a good evening. Hello Parents, Reminder 6th,7th and 8th grade students are invited to attend Super Saturday STAAR Tutorials. Class starts at 8:00 am to 12:00 pm. 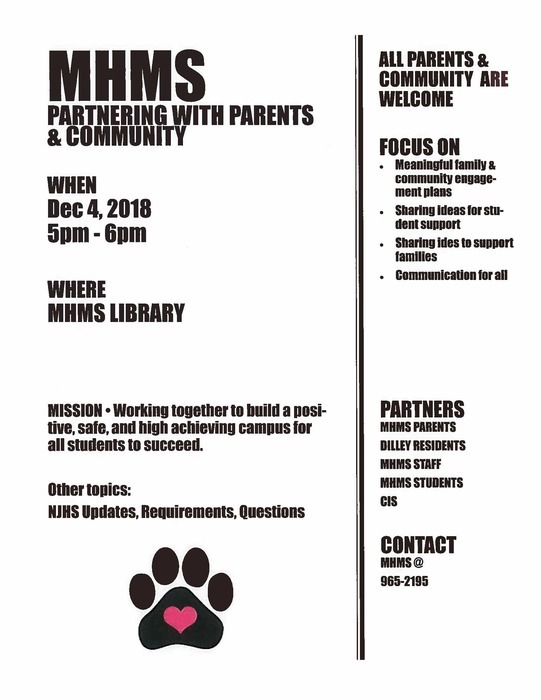 If you have questions please call MHMS. MHMS Picture Day is tomorrow Friday March 3rd in the library. 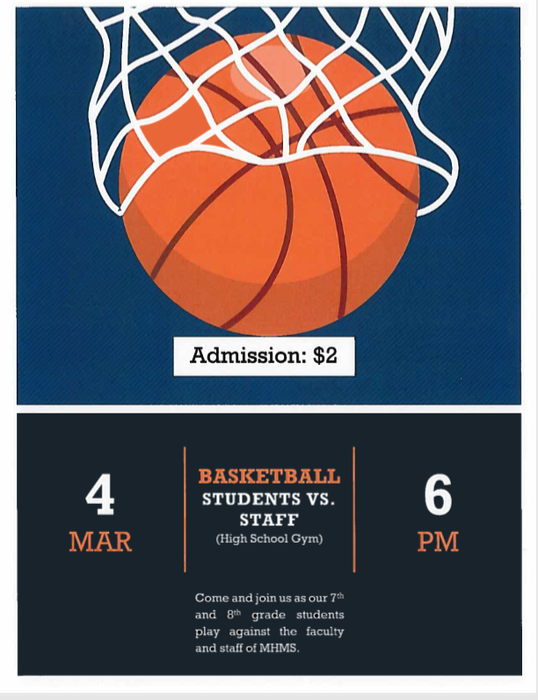 If you need a flyer we will have some in the office. If you are interested in earning college credits; there will be an informational meeting on Thursday February 23 at 5:30pm in the Elementary Cafetorium. Now recruiting incoming 9th graders. Hello MHMS Parents: your student is invited to attend the school board meeting today at 6:15pm at the administrative building. Your child is being recognized for participating in UIL this year.